To celebrate National Golf Month this August, new family-friendly offers are announced at the championship golf course at Woodloch Springs. There is nothing more exciting than seeing a new young player discover the challenge and intricacy of the game. As a life-long individual sport, golf teaches healthy competition in addition to self-discipline, dedication and of course passion. With golf season in full swing, Woodloch Springs championship-style Poconos golf course is on PAR to have a record breaking year with the amount of new golfers taking to the course. After watching Mickelson’s stellar performance in the British Open, the pros at The Country Club at Woodloch Springs are hoping that players act upon their hankering to get out on the course during National Golf Month this August. 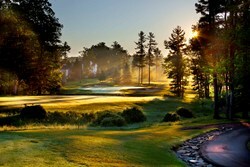 Opened in 1992, as part of the all-inclusive family resort, Woodloch Pines, Woodloch Springs offers players a unique destination providing a challenging course for players of all levels. As a nationally-recognized golf course and a member of the PGA affiliate courses with 18 spectacular holes within 90 miles of Manhattan, the course provides a top-tier destination without the sacrifice of long travel times. The beauty of Woodloch Springs is its approach to promoting golf as a lifelong sport to golfers of all ages. As a Get Golf Ready facility sponsored by PLAY GOLF America, those new to golf learn all of the key components needed to play the course with confidence during a series of five one-hour lessons taught by Woodloch’s very own golf professionals. On “Golf and Dine Thursdays,” golfers can play 18 holes for just $55. This price also includes a $20 credit to the Grille Room, the course’s on-site restaurant providing upscale American fare in a casual setting. Also on Thursdays, golfers can play a full round, and enjoy “family night dinner,” featuring a prix fixe menu at the Grille Room, all for $45. Ladies play 18 holes for only $50 on Thursdays after 11 A.M.
Children partaking in a Woodloch clinic play free after 4 P.M. with a paid adult. 2013-2014 club memberships now include “kids’ golf free” for those 15 years and under.